To begin, some context: a planetary survey is something you do to figure out whether a planet is worth establishing an outpost on. There might be other reasons to do it – for example, thinking about whether gathering survey data could be a good way to earn some early-game credits, and/or influence faction behavior – but those things aren’t central to the mechanic. The main path is: find a planet, survey it, and then establish an outpost. This implies some level of procedural generation, so that the planets and star systems you’re exploring differ from game to game. I don’t want to go into the details here – it might be worth it’s own blog post, and I’m not sure how much I want to dive into how it works in the first place, to avoid spoiling the experience – but will say that yes, procedural generation is now officially a feature. 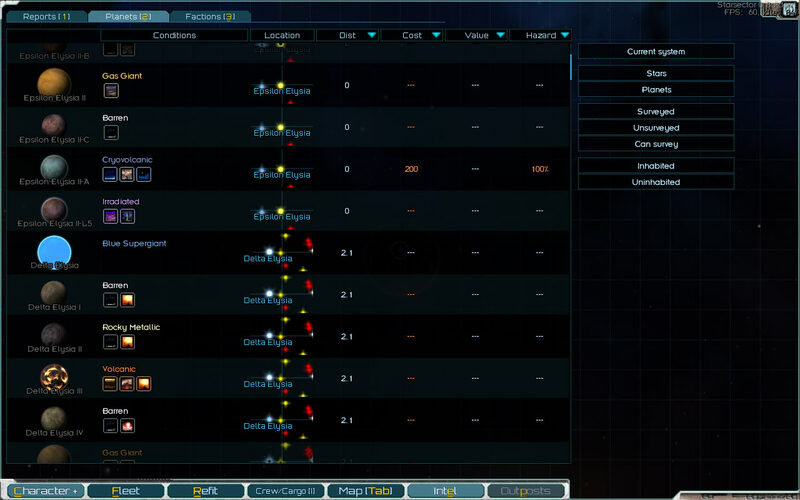 An important consideration is that the survey mechanic should be influenced by outside factors – skills, hullmods, etc. Why? It’s a core mechanic, and “surveying” is very much a sci-fi staple, a cool thing to do, so it makes sense that players would want to be able to specialize in it. This introduces a few potential design pitfalls. 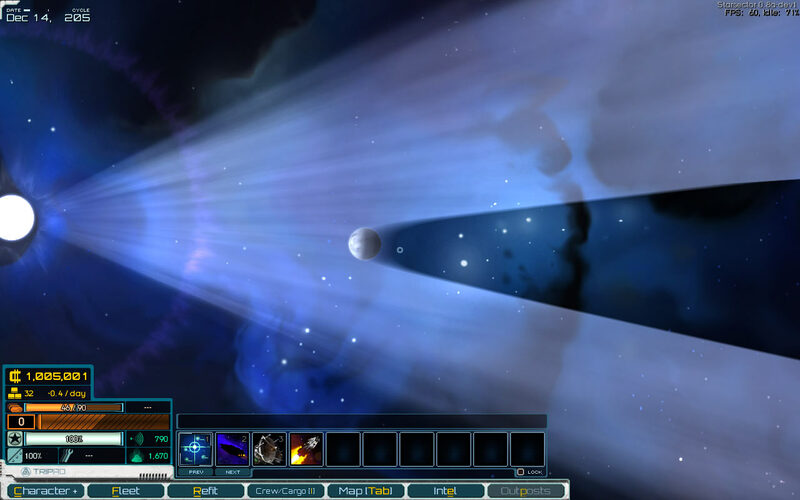 We don’t want a mechanic that drives the player to max out any related skills before performing surveys – it’s much better if players can survey planets as they’re able, instead of saving them up for a later survey at maximum effectiveness. We also don’t want “max survey skill” to be a hard requirement for any character that’s interested in establishing outposts. Not very bad if it happens as an outcome of the design, but would decrease the variety in character builds by forcing points to be spent here. Finally, it would be nice if a player might reasonably choose to invest less than the maximum number of points in surveying skill(s) – that is, not an “all or nothing” skill. This is related to the first point of not having to have max skill to survey. Taking a step back, what exactly does surveying do? Planets have conditions (same as “market conditions” in the latest release), and surveying will uncover them. For example, “rich ore deposits”, “trace volatiles”, or perhaps something more exciting. The initial approach – clearly perhaps influenced a bit by Dominions magic site searching – had each of the planet conditions assigned a “survey level” requirement to be uncovered. For example, a level 2 survey would uncover every condition with a level of 2 or below. This sounds reasonable enough at first glance – get good at surveying, find more stuff! However, thinking this approach through is what led to the “list of things we don’t want” above – which, regrettably, this runs afoul of many ways. 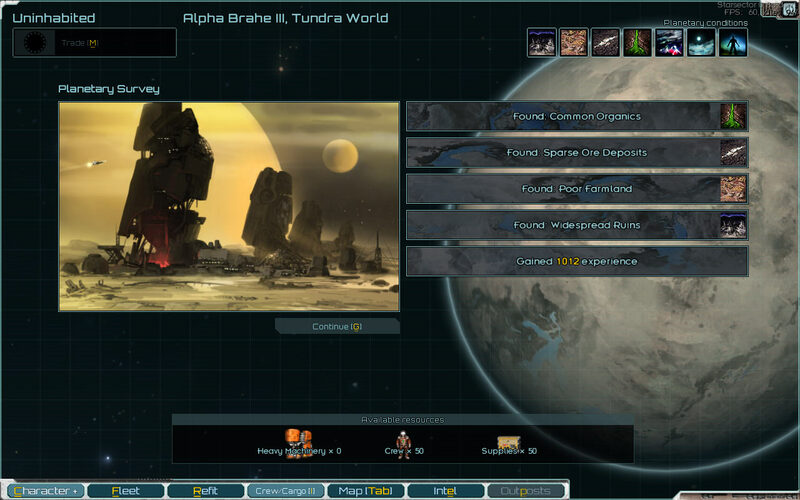 First off, would the player ever be happy with an outpost with some beneficial conditions left undiscovered? It leaves an outpost potentially running at well below top effectiveness – that’s bad enough, but it also feels like the sort of thing that would really rub one the wrong way to do. Maybe this outpost has an awesome condition you’re missing out on – or maybe it doesn’t. Inquiring minds have to know! So, if surveying worked like this, you’d always want to max out the skill. This also means that surveys at below maximum skill are… well, not entirely useless – they might still rule a planet out as something worth surveying further, later – but coming back to survey the same planets repeatedly doesn’t sound like something we want to mechanically encourage. It would also be an all-or-nothing skill, and would be required for establishing outposts; less character build variety on all points. Taking character skill influence out of the equation would resolve these issues. Perform a survey, get full information, no problem. But we still want skills to factor in! We’ve just established, though, that they absolutely can’t influence survey effectiveness. Surveying should be a binary operation, either a planet is surveyed or it’s not. What’s left, then, is for the skill to influence not how well a survey is done, but whether it can be performed on a particular planet in the first place. Planets have a “hazard rating”, expressed as a percentage. This rating is computed based on planet conditions, and any conditions that contribute to the hazard rating are visible without requiring a survey. For example, a tundra world would have “habitable” (-25% hazard rating) and “cold” (+25%), for a net hazard rating of zero. It might also end up with some other conditions that make it more hazardous – high gravity, extreme weather, tectonic activity, etc. The survey skill level determines the maximum hazard rating that you’re able to survey. What does this do? Most importantly, once you’ve surveyed a planet, you can count on knowing everything about it. A higher survey skill widens your choice of planets, and so improves the chances of finding desirable planets in convenient locations. Someone with a lower survey skill (or none whatsoever) will likely be forced to spread their outposts out, being confined to safer planets – but they won’t be any better off than someone with a high survey skill when it comes to those specific planets. Some inherently hazardous planets, like lava worlds, have a much higher chance to get the juicy resource conditions (e.g. “ultrarich transplutonic ore deposits”) – a low-survey-skill player will have to work harder to acquire access to the same raw resources. On the other hand, they’ll have a few more skill points to invest in improving other aspects of their industry. With this setup, it feels like there can be good reasons to go with zero, some, and full point investment into a survey skill. Another nice aspect is that the “hazard rating” was already in place for other outpost-related reasons, so we’re not even adding an entirely new planet stat. Planets also have a survey cost, based on the planet size and the hazard rating. The cost includes crew and heavy machinery (not consumed; that’d be a bit dark in the case of crew) and supplies (consumed). Why have a cost? Surveying grants experience, so having it be entirely free might encourage players to survey everything just for the XP, turning it into a chore. Beyond that, it feels right to have surveying be something you need to specialize your fleet in to be really good at – i.e. it’s not something you can just do with a single frigate everywhere. That’s not to say a single frigate can’t survey anything – it might do fine with a small moon around a gas giant, but it’s not going to survey a high-G irradiated world with a toxic atmosphere, or even come close to being able to. Having to carry crew and equipment around is a nice way to accomplish this without adding any new stats. Continuing with the idea of specializing your fleet, a “Surveying Equipment” hullmod (probably unlocked by the survey skill, but that’s TBD) reduces the survey costs by a flat amount. Some ships, such as the Venture and the Apogee, come with this hullmod built-in, to further solidify these ships as exploration-themed. Some active abilities pertaining to surveys are also in the works, but I’m not prepared to talk about them just yet. Surveying generates a lot of data – planets, conditions, hazard ratings, survey costs. We’ll naturally need a screen or two to access this information. 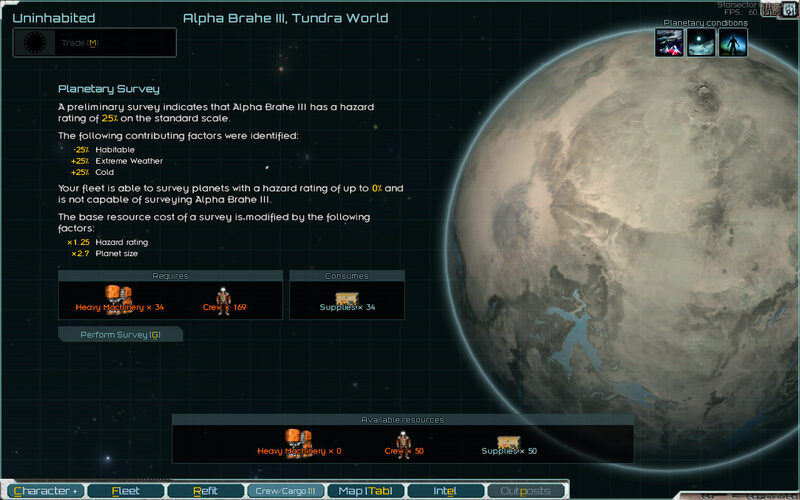 First, there’s a list of all the planets you’ve discovered, which gets added to whenever you visit a new system. It starts out populated with all the systems in which there’s human presence. The list can be sorted in various ways and filtered using the buttons on the right. You can get more detailed information about a planet or star by clicking on the row. From the detail screen, you can also switch between known planets in that star system, and switch to a different star system by clicking on the map in the lower left. The UI may evolve some if the anticipated requirements for what the player needs to do using these screens change. 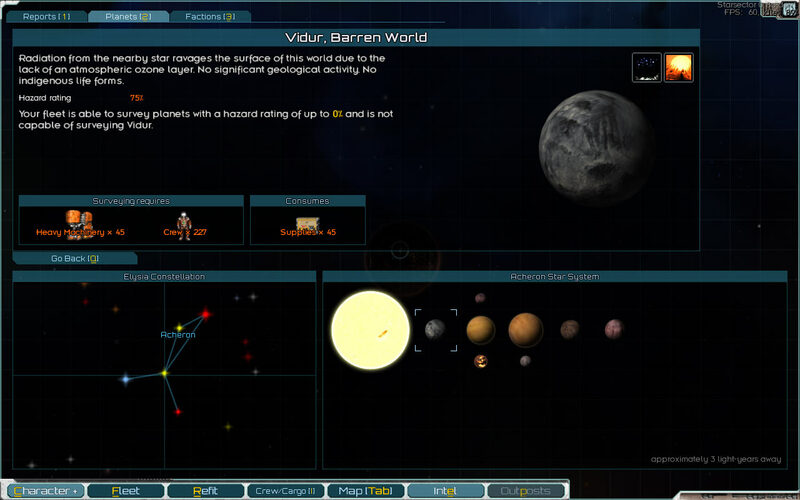 For example, it might be useful to sort planets by something more specific than “value” (a sum total of the worth of the “good” conditions, a rather abstract number) – the abundance or ore or volatiles, perhaps, or any potential production modifiers. As with everything, things are subject to change, and I’d be surprised if this made it to release in this exact state. In particular, the details of how outposts work might drive some changes here – but that’s a topic for later. This entry was posted on Thursday, June 9th, 2016 at 7:01 pm	and is filed under Development. You can follow any responses to this entry through the RSS 2.0 feed. Both comments and pings are currently closed.